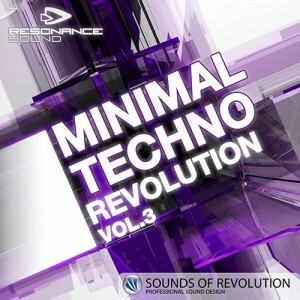 Distributed by Resonance Sound, Minimal Techno Revolution Vol.3 covers special organic sounds (e. g. live drums, live bass loops, field recordings) right next to all-time favorites such as true analog drums, SID samples (C64-style), loads of drum loops with/without kick and a variety of carefully processed vocals. Missing something? How about kit loops for starters, dark and mystic atmospheres, hypnotic bass and synth loops, semisynthetic field recordings or never-heard fx sounds shaking the ground to its every bit? Have a listen to the demos below – Minimal Techno Revolution 3 easily proves once again that skillful attention to detail translates into a unique, creative and handy addition to any electronic music producer’s toolkit. To add a little tech talk, this massive sample pack delivers more than 1.400 samples at 24-bit WAV (1,43 GB WAV) quality and including all common sampler formats (REX Stylus-ready, EXS24, Kontakt). As usual, they are sorted into categories, incl. root key (if applicable) and designed with sufficient headroom to perfectly fit into your arrangement. Everything has been worked out in great detail in taking care of every detail so manic every nuance, nothing was left to chance, the end result is an arsenal of sound that perfectly expresses the true essence of the new age Techno sound.